At Yale College, we are dedicated to providing a liberal arts education that fosters intellectual curiosity, independent thinking, and leadership abilities in our undergraduates. Yale’s resources, coupled with an active campus presence of distinguished museums and performing arts organizations, insure that Yale art students remain fully engaged as active partners in the unfolding of new understanding, new work, and new research. With its robust undergraduate curriculum and diverse student body, its plentiful overseas study, research, and internship opportunities, the support offered to faculty, and programs designed to bring international distinction to our campus, Yale committed to its position as a leader in global education. Through their course work and in the lab, Yale undergraduates have the opportunity to learn from leading thinkers in their fields. The faculty’s dedication to teaching underscores Yale’s commitment to foster new ideas and encourage active and independent thinking. Yale undergraduates may develop their writing skills in any one of 170 courses, spanning more than 40 departments and ranging in subject from psychology to philosophy to film studies to ecology and evolutionary biology. The Freshman Holiday Dinner: All first year students, about 1300 or so, are invited to this dinner which is held just before the start of the Fall semester final exam period in early December. The event takes place in the oldest dining room called “The Commons”. The highlight is the “Parade of Comestibles” where large platters of food are marched into the room including a ten foot long loaf of braided bread. One of Brown’s most well-known former faculty members—professor of psychoceramics (the study of cracked pots) Josiah S. Carberry—never actually existed. But his name lives—Carberry is the namesake for the beloved late-night eatery “Josiah’s” and for the Brown library online catalog. Students gather every Halloween at midnight in Sayles Hall for the annual organ concert. Blankets and pillows in hand, students gather on the floor of the vast hall and listen to the university organist play a selection of appropriately spooky tunes on the largest remaining Hutchings-Votey organ in the world. A similar assembly happens right before winter break, when many of Brown’s singing groups perform holiday themed concerts in Sayles. Whether you are a Yale College, graduate, or professional school student, your academic life at Yale is filled with opportunities to engage, collaborate, and learn. A Yale education emphasizes the importance of learning for public service. There are plenty of volunteer opportunities at Yale and in New Haven that will allow you to connect with the surrounding community and make an impact during your time here. Yale College recognizes that organizations under the leadership of undergraduates can and do enhance a student’s education by providing additional opportunities beyond the curriculum for personal development and growth. Yale students are active and engaged in hundreds of student groups and activities. There are hundreds of ways to stay physically active and enjoy sports and recreation at Yale, in Greater New Haven, and in Connecticut. Whether you’re looking to attend a sporting event, work out at the gym, or play on a team with peers, Yale offers many ways to participate in an active lifestyle. Biking, hiking, running, and exploring Connecticut’s recreational experiences beyond Yale’s walls is also part of the student experience. There are an abundance of performances across Yale’s campus, filled with the talent and skill of students and professionals. Yale also has some of the most admired museums and galleries for miles around, constantly filled with new and inventive exhibits. The tradition was established by a young gentleman from Victorian England, who attended Yale in the 1890’s. The line now numbers 17, and the original successors have been the intimates of deans, directors, and coaches. One was tended by a head cheerleader who went on to become the Secretary of State. Another was featured on the cover of a national magazine. Yale was the first university in the United States to adopt a mascot, and to this date, none is better known than Handsome Dan. 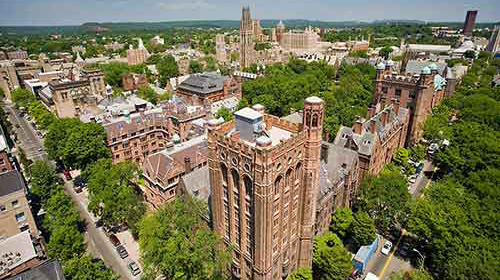 Yale University is a large research university with a wide array of programs, departments, schools, centers, museums, and many affiliated organizations. Yale College, the undergraduate study program of Yale University, provides a liberal arts education that fosters intellectual curiosity, independent thinking, and leadership skills. Yale’s advanced degree programs are close-knit communities with access to vast resources. Yale has well over 145 departments and programs in a wide range of disciplines. Yale has more than 5,500 undergraduates, 2,800 graduate students, and almost 4,000 professional school students. Yale has a rare book and manuscript library with “windows” of translucent marble to prevent the books from being exposed to direct sunlight. Being the third oldest university in the country means you can probably claim a bunch of “oldest ____” superlatives. Yale is home to the oldest collegiate daily newspaper still in existence. Printed five days a week since January 28, 1878, the Yale Daily News lives up to its moniker. Yale also claims the oldest and most well known a cappella group: the Wiffenpoofs have been singing on Monday nights since 1909. Yale University is organized into 12 self-governing residential colleges, each with its own dormitories, dining halls, library, and social events. Each also has its own proud traditions, including: jello wrestling, weekly group screams at 11:00, stripping down during the third quarter of football games. (born June 12, 1924) fought in WWII and was elected to the U.S. House of Representatives. He was Ronald Reagan’s VP for two terms and then won the 1988 presidential race, losing his bid for a second term to Bill Clinton. He has since made appearances for George W. Bush, his oldest son, and started the Bush-Clinton Katrina Fund with President Clinton. (born June 23, 1948) attended Yale Law School. He later served in various posts under the administrations of presidents Ronald Reagan and George H.W. Bush. The retirement of African-American Supreme Court Justice Thurgood Marshall led Bush to nominate Thomas as the judge’s replacement, and he was narrowly confirmed in 1991 despite being accused of sexual harassment by lawyer Anita Hill in public hearings. Thomas is a staunchly conservative justice who favors small government while opposing more liberal benchmarks like affirmative action and gay marriage.